A cross section of the famous and those bound to become so, this collection is a riveting experience highlighting the expanding importance of this dramatic and exciting new genre. Creative nonfiction, also known as narrative nonfiction, liberated journalism by inviting writers to dramatize, interpret, speculate, and even re-create their subjects. Lee Gutkind collects twenty-five essays that flourished in this new turf, all originally published in the groundbreaking journal he founded, Creative Nonfiction, now in its tenth anniversary year. 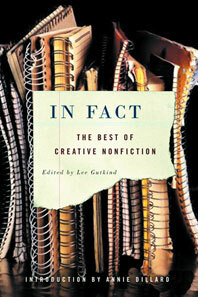 Many of the writers here are crossing genres—from poetry to fiction to nonfiction. Annie Dillard provides the introduction, while Gutkind discusses the creative and ethical parameters of this new genre. The selections themselves are broad and fascinating. Lauren Slater is a therapist in the institution where she was once a patient. John Edgar Wideman reacts passionately to the unjust murder of Emmett Till. Charles Simic contemplates raucous gatherings at his Uncle Boris's apartment, while John McPhee creates a rare, personal, album quilt of his own life. Terry Tempest Williams speaks on the decline of the prairie dog, and Madison Smartt Bell invades Haiti.